Another year, another round of speculation as to when Los Angeles will once again become a pro football city. After nearly twenty years without an NFL franchise, this year’s conjecture comes from the mouth of an NFL owner. Three days ago, the Dallas Cowboys opened up their training camp in Oxnard, meaning long-time owner Jerry Jones wasn’t too far from the field. Speaking with the media, the El Segundo native implied that logistically, the NFL is closer to returning to Los Angeles than it has been since its departure in 1995. While Jones has a son on the NFL stadium committee and has a great deal of insight into the operations of NFL franchises (as well as potential reasons for leaving a city), it seems not much has changed in the past two years. 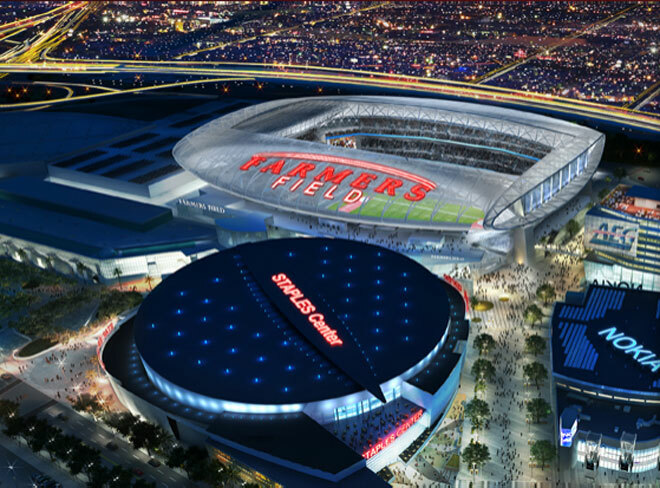 Two possible sites—Farmers Field, the Anschutz Entertainment Group’s downtown Los Angeles proposal and Ed Roski’s stadium proposal in the City of Industry—remain stuck in the idea stage, waiting on an NFL franchise to commit to relocation. No developer, regardless of wealth, is foolish enough to construct an NFL-caliber sports venue that would only be used to host CIF playoff games. The roster of the teams most likely to move to L.A. today looks a lot like the one we outlined back in 2011. The San Diego Chargers and Oakland Raiders can both get out of their current leases at the end of the year, and the St. Louis Rams would have the same option in 2014. At least one possibility, however, is evaporating. The Jacksonville Jaguars have been drawing small crowds for years and have long been the subject of relocation talks, but look like a strong candidate for the NFL’s European expansion aspirations, leaving Los Angeles as a secondary option. The first roadblock for these teams will be leaving their current cities. Not only must teams file for relocation with the NFL in the first month-and-a-half of the intended year of moving, but they also need to prove that all efforts to stay put have been exhausted before commissioner Roger Goodell would sign on the dotted line. The next hurdle is all too familiar to Angelinos: construction. Even with multiple options for luxury stadiums on the table, one won’t magically be built overnight. All indications point to a four-to-five year grace period during which the lucky team(s) would play on Sundays at either the Rose Bowl or the L.A. Coliseum, two facilities needing renovations, with just-fading UCLA or USC logos at midfield from the previous day’s game as an added bonus. Several years into their new home, however, the team of destiny could find solace in calling one of the NFL’s finest stadiums, wherever it happens to be in Los Angeles County, home. What Jones’s words indicate is something that we’ve been saying for years: We are ready and the money is ready when the teams are, too. Of course we’re talking about major business transactions taking place, and major sports franchises don’t just uproot themselves on a whim, but viable options and financial solutions certainly don’t hurt. And with the Rams, Raiders, and Chargers owning the league’s 28th, 29th and 30th-worst 2012 attendance percentages, respectively, the motive is there to make L.A.—two decades removed from itself playing the victim—the NFL’s latest getaway destination.